Boss MT-2 Metal Zone Review – Best Metal Distortion Pedal? Gain-obsessed guitarists have long searched for heaviest and most extreme distortion sounds. As distortion effects pedals became the norm for pushing amps over the edge into extreme gain territory, along came pedals such as the Boss MT-2 to push heavy distortion to its limits. With it’s dual-stage distortion circuit and deep EQ controls, the MT-2 has been a defining effect pedal for crafting extreme metal tones. In our Boss MT-2 Metal Zone review, we’ll see if it’s the best metal distortion pedal you can find. Dual-gain circuitry provides a unique double-stage distortion for generating extreme amounts of gain. Heavy mids and lows and super-long sustain like a stack of overdriven amps. Want some Boss MT-2 Metal Zone settings? I started with a humbucker equipped Gibson SG and put this pedal in front of a clean amp channel with all the tone knobs set flat for a pure clean sound. I then set all the tone knobs on the MT-2 at 12 o’clock and gave it a stomp. This pedal took the sound from clean to carnage instantly. A wave of massive gain erupted from my humble little amp, turning it into a vicious metal machine. The MT-2 packs enough gain to scare your other guitar pedals off your pedalboard. Cranking up the Dist knob to a more satisfying setting while attenuating the Level control created the perfect massive high-gain tone. This pedal is an instant way to add a killer lead channel to any clean amp. The real magic of this pedal comes from the Equalizer housed in 2 signature Boss double knobs with inner and outer control. The left one lets you dial in just the right about of thick bottom end with the Low control while the Top makes your sound as cutting or restrained as you need it. The Middle and Mid Freq controls are what make this pedal really shine. While it can take some adjustments to really hone in that perfect metal tone, you can find tones reminiscent of anything from old-school James Hetfield from Metallica to Dimebag Darrell of Pantera. This pedal rewards those who put in a few moments to really listen and dial-in a great metal sound. The pedal has a compressed feel to it, cranking about a consistent level of massive distortion and volume. It’s perfectly suited for crushing metal rhythm tones. With all the tone-shaping options on board, you just might find your signature lead sound for soloing while you’re at it. While Boss has released extreme distortion pedals since the MT-2 Metal Zone including the MD-2 Mega Distortion and ML-2 Metal Core, the classic MT-2 still remains a best-seller and is one of the most popular effects pedals of all time for crafting intense metal tones. It paved the way for such great modern metal distortion pedals including the Rivera Metal Shaman and Empress Effects Heavy. One more thing… if you’re going to crank up the gain on your Metal Zone, consider putting a Boss NS-2 Noise Suppressor after this pedal in your signal chain for the tightest, noise-free sound, or put the MT-2 in the NS-2’s loop. These two pedals were made for each other. The Boss MT-2 Metal Zone has achieved legendary status over the years as the most popular pedal for anyone seeking massive distortion and in-depth tone control. It’s certainly a hard pedal to beat as its countless devoted users will agree. The MT-2 will turn any boring or lifeless clean-sounding amp into a formidable metal powerhouse. 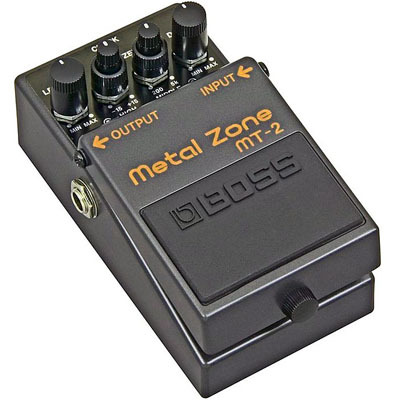 The Boss MT-2 Metal Zone is still a top choice for many as the best metal distortion pedal. It’s certainly a forerunner at a low price within reach for any guitarist on a budget. That concludes our Boss MT-2 Metal Zone review. Thanks for reading. 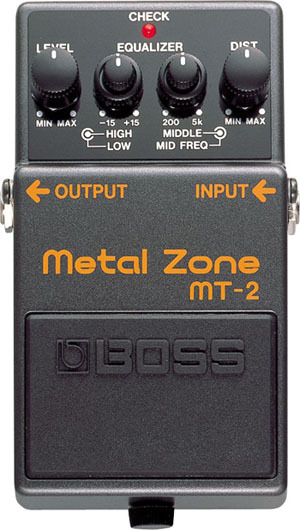 Want to buy the Boss MT-2 Metal Zone? Beginner guitarists check out our guide to online guitar lessons. thanks for the review. i have bought this pedal a few days ago and i am amazed! it turned my cheap cube10gx amp into a rocking metal machine!. i don’t get why the haters are hatin on this pedal. basically i am using these settings often for a good heavy metal tone( Low and high: Max Middle and Mid freq: 8 o clock distortion: 12 o clock) . one thing i know about this pedal is that it doesn’t sound good with every amp and it requires some time to get the equalizer settings that you admire. Thanks- you did the work for me…But is that good? Mmmm,… thanks though,very helpful info…Settings were exceptionally helpful. Wow, thanks for the settings man, awesome.